A fresh, clean exterior color palette is one of the most cost-efficient ways to quickly enhance the overall curb appeal of your home. Over recent years, vinyl siding has continued to make great strides due to its ever-increasing quality, improved manufacturing methods, enhanced energy-efficiency, better installation techniques, and the array of several exciting new colors and various styles to choose from. Which colors are best for vinyl siding? One of the easiest ways to get appealing color ideas for your new vinyl siding is to simply take a drive through your local neighborhood and see what catches your eye as well as your interest. Or, try flipping through some of the top design magazines to see what tickles your fancy. A common mistake homeowners often make in choosing exterior colors for their home is picking colors that are too light. 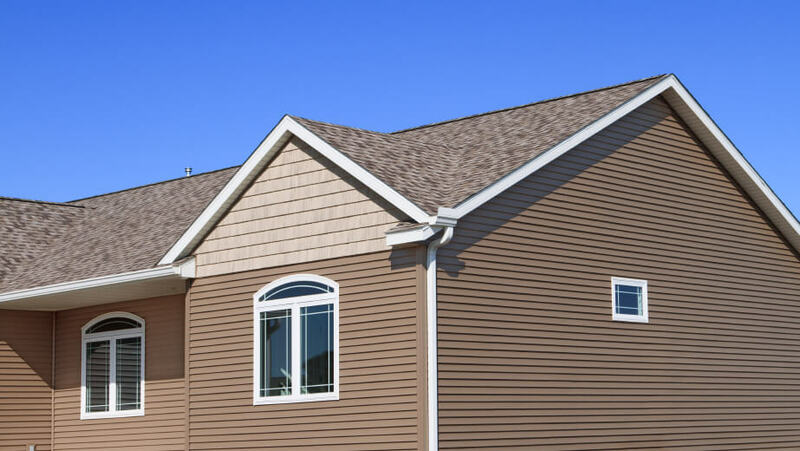 When choosing your vinyl siding colors, they usually need to be a bit more on the gray or brown side in order to look appropriate. Bold, un-muted colors tend to look more like primary colors (think coloring crayons) or even on the garish side. When in doubt, choose a color that has more underlying tones of gray in, not actually “gray” per se, but a more toned-down, muted version of the color itself. Try to keep the siding and trim colors somewhat related to one another. If you’re really having trouble, choose colors from the same family to be safe. Whatever color you choose for your vinyl siding, make sure you test it on your home first. Even seasoned pros with vast experience would never simply choose a color from a paint chip, buy the paint, and start painting without testing the color first. Ask your vinyl siding contractor about either getting a few vinyl samples to take back home and experiment with, or color-match a color you like from the vinyl sample itself. Next, paint it on a sample board or even directly on the exterior of your home to see how it looks. Different times of the day will cast different shades of light on it, so the only real way to know if it works for you is to test it first.